I've got this theory that whenever a chef doesn't know how to describe a flavor, they say it tastes nutty. Want proof of my theory? 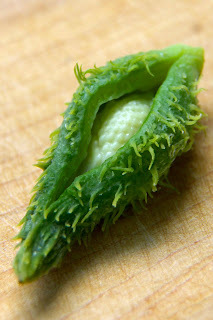 I was looking up information about lovage, and saw it described in several places as nutty. Seriously? Lovage, to my tongue, tastes like celery on steroids. Nutty might be one of the last words I'd use to describe it, right after fishy and chocolaty. Nutty chefs! So much for trained palates. The point of this little rant is that I've got a fantastic lovage plant in my garden, which does not taste of nuts. It's a perennial, and grows vigorously every summer despite the heat and lack of moisture. The only problem is that I'm not quite sure what to do with it. As I mentioned, it's flavor is celery-like, only much more forceful. 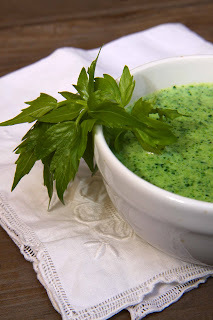 I've used a few leaves of it in salads and soups, but I don't have any lovage recipes. I really wanted to create a recipe in which lovage would be the dominant flavor, and not just an accent. In the future, I might play with the seasonings in this soup. 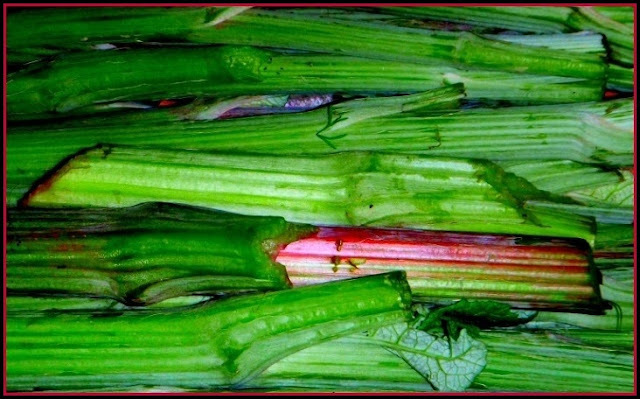 But this time, I kept the flavors clean, to let the lovage stand on it's own. The soup turned out to be very refreshing, and felt like a celebration of spring. Begin by sauteing an onion in butter until soft, but not brown. Throw in a big handful of tender young lovage leaves, and about 3-4 times as much of a mild lettuce (I used a combo of mache and my garden salad mix). 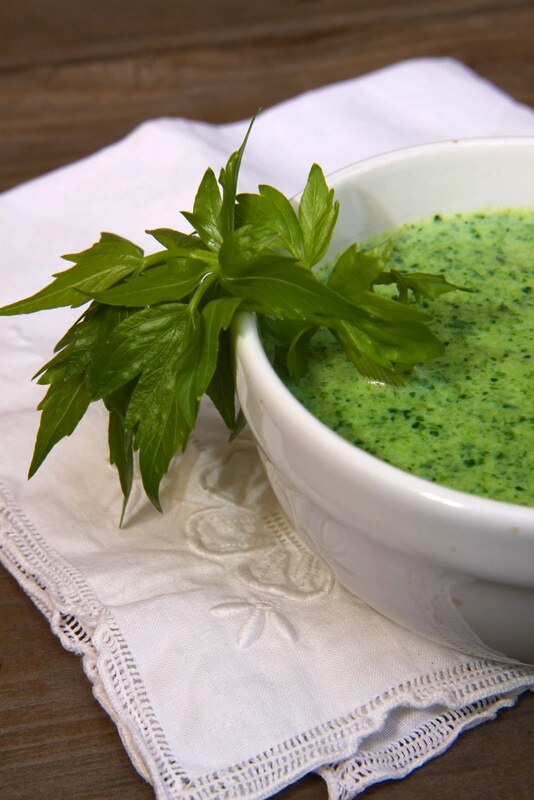 As soon as the leaves are wilted and deep green, put them into a blender, add enough milk to make soup, and blend until smooth. Return the mixture to the pan, season with salt and pepper, and gently heat for 10-15 minutes to let the flavors combine. If you've got a favorite lovage recipe, I'd love to hear about it. I'd really love to get more use from this herb. Oh boy, am I always the last one to the party? Yes, once again. But I brought soup! I just discovered Foodie Friday at Designs by Gollum. It's like a reading a whole cookbook of recipes every week. Go! Read! Have fun! Congrats on your weight loss (blog title). I think this is my first visit here. I'm looking forward to seeing what you have to offer. Lovage is strong stuff! I just know that if I think about it long enough, I can come up with a clever use for it. My next idea is to use it with fish en papillote. Hello my friend in butter! Yum, indeed.